Phew. It’s all over. And a new era has begun. Here’s an overview of everything we know so far. The …. is a “magical and revolutionary new product,” according to Steve Jobs. He would say that. But he’s right. The PowerBook was the first modern laptop computer, back in 1991. In 2007, Apple reinvented the phone. Netbooks, though, aren’t better at anything. Remember when Apple said it couldn’t compete at that price? It was because they couldn’t create something that they’d be proud of. 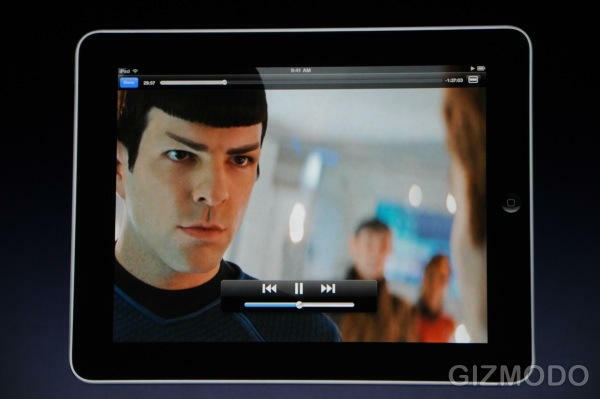 So instead, they’ve made the iPad. And yes, it looks – and behaves – rather like a huge iPhone. But there’s much more to it than that. You want a keyboard? You got one. You got two, in fact. Either a built-in software keyboard, or a plug-in hardware accessory. What else do you want? You want a gorgeous, huge, web browsing, photo-displaying, movie-watching screen? Yup, you got that too. The UI looks just like the UI we’re all accustomed to. The iPhone icons are there, only spaced further apart, taking advantage of the extra space. There’s a very OS X-like Dock at the bottom of the screen. Connectivity: we still have wires, sadly. Everything syncs with your main computer over a cable, just like your iPhone does. If you want 3G data, you can get that too: on demand, no contract, just prepay when you need it. It’ll cost you $14.99 for 250MB/month (euw), or $29.99 for unlimited data. In the US, AT&T is providing the link. Internationally – well, they’re working on it. And the iPad sells unlocked. Right up against the Kindle, the iPad comes with an app called iBooks. 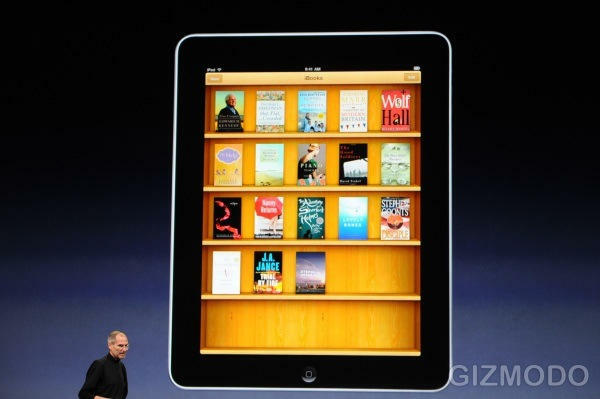 It includes a Store – of course – and it looks an awful lot like some of the ebook readers we’ve already seen for iPhone/iPod. It also comes with a completely re-invented version of iWork. It’s got Keynote, Pages, and Numbers, all of it re-made for your fingers. The Numbers UI is the nicest-looking spreadsheet you’ve ever seen. Each app costs $9.99. 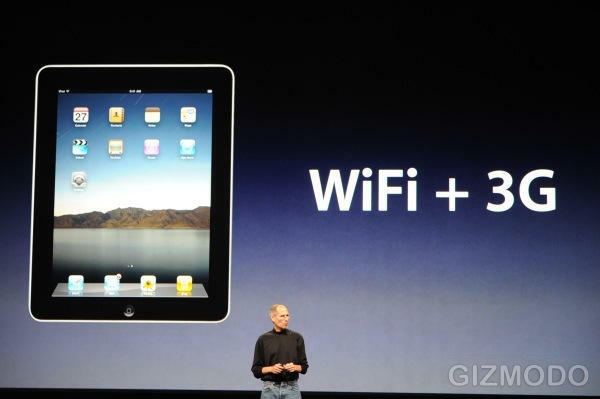 The iPad runs on an ARM-based 1GHz chip called the A4. Storage is 16, 32 or 64GB of Flash memory. It has 802.11n wifi, Bluetooth, a speaker, mic, accelerometer, and a compass. 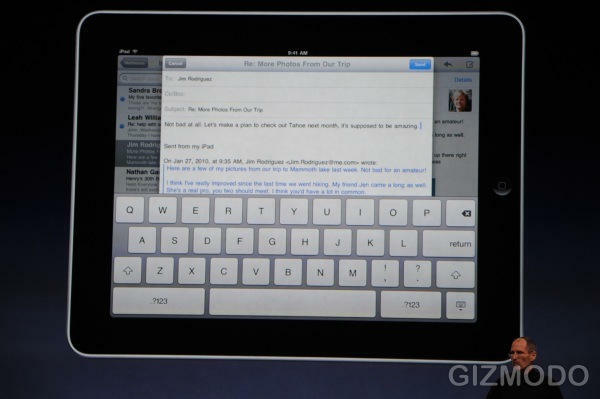 The iPad is 0.5 inches thin, weighs 1.5 pounds, and has a 9.7-inch (diagonal) IPS multitouch screen. Steve says it will last for 10 hours on a battery charge. Freee-oww. There are 100,000 apps on the App Store and every single one of them will run on the iPad straight away. Either at iPhone size or pixel-doubled up to fill the screen. And of course, developers who want to create apps from scratch, apps that take advantage of that huge screen, can make use of the brand new SDK which is out today. A camera. Video-out. (How you going to present those iWork presentations?) An SD slot. Or even any slots of any kind. They’ve kept it simple. It looks like a huge iPhone for a reason: people know exactly how the iPhone looks and works, and this will be a very natural progression. It will feel comfortable, easy: but also exciting, because it’s a bigger, more expansive experience. This is more of the same, only evolved. This is the new MacBook. It’s cheap, it does most things that most people need for most of their daily computing. This is it. The 3G data link: OK, so 250MB/month is puny, but this time there is no contract. You buy connectivity when you need it – just for one trip, one business meeting, one vacation. You’re not tied in. Apple gets it. The price: this is the key. This is Apple answering all those critics who have kept saying its products are overpriced. At $499, these puppies are going to fly off the shelves in vast quantities. Oh, and one more thing: this is just version 1. Wait a year. If you think the waiting is over, you’re mistaken. It’s only just begun.